Can you believe it's October already? It's definitely starting to feel like fall in Pittsburgh, and before we know it, it'll be winter and Christmas time! Since it's a new month and it's been a while since we caught up on life, it's the perfect time for What's New With You linkup! I'm joined, as always, by my co-host Kristen. Make sure you go over and say HI! and link up below. Let's get to some life updates! I have my next race on Sunday, and training has been great lately (you can see all of my training recaps here)! I shared some of my goals on Tuesday, and I'm really excited to be back at the race where I got my first sub 2:00 half. I'm a little worried about the weather, just because the race is on a crushed limestone trail with lots of lakes and creeks. I love to run in the rain, but running a muddy and flooded race does not sound fun to me! I'm finally in a workout routine that works for me, and now it's easy to stay on track. Lately I've been running before work on Monday, Tuesday, Wednesday and Thursday (depending on how I feel, sometimes I'll take an extra rest day) and going to a lunch time yoga class on Tuesdays and Thursdays. After my race, I want to start trying out new classes at the gym! For now, yoga has been a great addition to my running, and I absolutely love the class that I go to. It's amazing how different of an experience you can get depending on the instructor, and this one is the best I've ever been to. I hope that the other classes I try out are just as good! It's now been three full months since I went vegan. It's been going really well so far, and Dan and I are both loving our life-style change. We've been hosting monthly/biweekly vegan dinners, which has been great to try out new recipes (and has also helped keep our house sparkling clean at all times)! I posted about why I went vegan and tips for starting out, as well as lunch ideas if you're interested in giving veganism a try. I have a few more posts planned, but if there are any topics that you would be interested in hearing about, please let me know! I am definitely a goal-oriented person (which is probably a shock to none of you), and all year I've been setting a ton of monthly goals and updating you all at the end of the month on how I did. That's been working on great for me, but for the last three months of the year I want to switch it up a bit. - Finish a scrapbook. I finally bought a few empty scrapbooks so I can't use that as an excuse, and now I just have to get all of my photos and accessories and put one together! - Sew an apron. It's on my 30x30 list to learn how to sew and make something, and I decided that I really want to make an apron since I love to cook! I even found plans for one, so now I just have to buy the fabric and actually make it. - Finish my Belize posts. I shared a few posts on Belize, but I realized that I never finished! I have a few more things that I want to share, and I want to do it ASAP. Look out for those this month! I love hosting people, and if I actually had friends, I agree--that would be a great way to force me to clean up my act! I'm behind on Europe posts from April. So I get it. And still need to make a picture book. In lazy and do it all on shutterfly and just have it printed cause me buying scrapbook materials is dangerous. I loved the recap. I think it would be so fun to be a homeowner. And a lot of work too. I need to get back into hosting friends.I used to do that a lot! I need to finish my Italy recap posts too- thanks for the reminder :) I'm sharing my 30x30 list on the blog tomorrow since it will be my 30th bday- I'll have to take a look at your list and see if we have any similar goals!!! I know how to sew! Now there's a fun fact for you! I learned a little bit in home ec in high school but mainly my mom taught me because she's like a crazy good seamstress. I do have bad memories though of growing up being forced to wear not only handmade clothes but hand me down handmade clothes from my two older sisters. They're 10 and 8 years older than me! So I'd get Tracey's dorky outfit and just as I outgrew it I'd inherit Lori's. UGH. Oh, my mom sews dog clothes. She sells them on Etsy! I think her store name is fashions by pauline or something like that. HA HA! i need to have people over so it makes me clean my house, hahaha. jk. good luck with the sewing, i have done a few small things but never an apron, and i haven't touched my sewing machine in a year or more. oops. gotta get back into it, because my skills are not great lol. i don't mind running in the rain as long as it isn't raining when i start out - which of course is ridiculous because you can't control the weather, but i just hate starting in the rain. so i hope it doesn't rain for you because a muddy trail does sound a bit like a recipe for disaster. Hope the race goes well! I really think that yoga and running complement each other nicely...I love both of those activities myself :) The instructor definitely makes it for me, too!! I think the last few months of the year are a great time to finish all those things you've been putting off. I get very motivated by the end of the yea feeling and wanting to start afresh with the new year. Good luck ticking everything off! 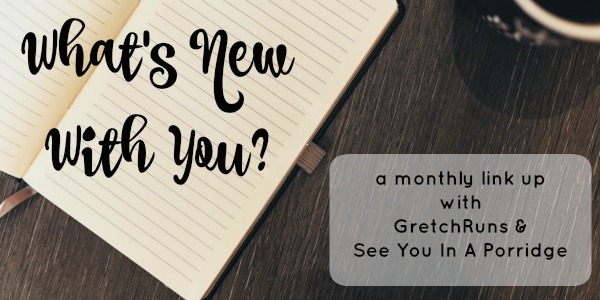 So glad it is "What's new with you" time because I have been falling behind in my blog reading, but at least now I feel somewhat caught up! Good luck on Sunday! And congratulations on reaching 3 months of veganism! Good luck this weekend - I hope the weather cooperates for you! Good luck with your race! I just went to my first ever yoga class on Saturday and then I went again yesterday - I'm so surprised at how much I like it! I hope the novelty doesn't wear off and I can keep it up! So true - hosting dinners/people over is the BEST way to keep your house tidy! I always joke that it's the only time I really truly clean and tidy up lol. We've been in our current house for over a year and I still feel like we always have a weekend project on the go! Good luck with your race! I am often impressed with people's commitment to veganism. I'm terrible with goals. I don't set them, so I am also impressed with the commitment of goal-oriented people like yourself. I hope you have an AWESOME race, girl! Here's hoping the weather is perfect for you! I'm interested in your vegan journey, going to read those posts now! I'm glad it's going well for you, I'd love to go vegan but I'm just not sure I have the commitment! I think I'll try starting out slow with the odd vegan day and I'll see how I go. I hope the rain holds off for your race! I hope your race went very well and the rain stayed far away while you were out there. I sure don't have your discipline (or balance... or anything athletic, actually) when it comes to things like running, but I think it's awesome that you love it so much.